The Suki Organic Pu Erh come from the mountainous southern Chinese region of “Yunnan” which borders Myanmar, Laos and Vietnam. The tea plants grown in this region are of a much larger leafed variety than the type grown in the other regions of China which have much smaller leaves. The most famous tea from Yunnan is Pu Erh, a specially fermented Black tea which has an earthy, woody character. Fermentation is a tea production style in which the tea leaves undergoes fermentation and oxidation after they are dried and rolled. The liquor has a Ruby red colour. The tea can ripen with age, and can be cellared under controlled conditions just like wine, this is very popular in China where professional cellaring is carried out under controlled temperature and humidity for the best qualities, which then fetch astronomical prices. This black Chinese tea can generally improve in taste over time due to this process. Teas that can be aged finely are typically made from high quality leaf; processed skillfully and stored properly over the years. As a digestive, nothing is better, more satisfying or more calming than Pu-erh tea from China's Yunnan province. An aged, fermented tea, Pu'erh has clean, mellow, earthy qualities and is particularly good after a multiple-course feast like a Thanksgiving or similar heavy holiday meal. 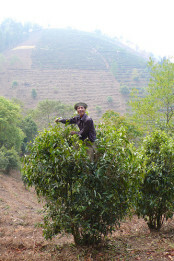 There is very little Organic tea produced in the Yunnan province, and this makes this tea very rare and unique too. Combine the tea and bourbon in a jar and cover the jar. Let steep at room temperature for 2 hours. Strain the tea leaves and discard. Store infused bourbon in a sealed jar and begin to create fantastic Whiskey recipes! Put the sugar in an serving glass (usually a tumblr) then add 3 dashes of bitters. Add just enough water to cover the sugar and muddle the mixture until the sugar is dissolved. 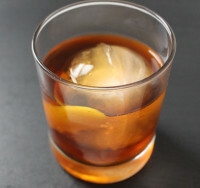 Add the Pu Erh infused bourbon and top with ice, garnish with lemon twist.